Please refer to our stock # 6076 when inquiring. Sailing into town bringing good fortune, the takarabune is a New Year's tradition in Japan, especially for businesses. 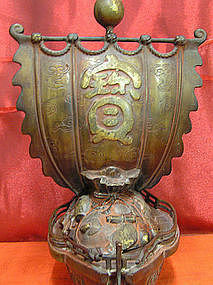 This two piece cast bronze ship, with good traces of old red lacquer, with large sail showing the character for treasure, is very well modeled and decorated with detailed incised motifs including a kirin flanked by a dragon and a phoenix, together with a number of attributes that bring good luck. I can identify the sacred key, the hat of invisibility, the scrolls, the lucky hammer, an open book, precious jewels, the never empty purse, perhaps a rice bail and the protective rain coat. The sail is decorated with cloud motifs and the body of the ship with wave motifs. Late Meiji/early Showa. Fine condition. Measurements: H 14 1/2", W 11."